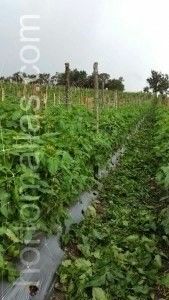 A good financial return on a crop depends on phytosanitary protection in the fields and tutoring tomatoes with HORTOMALLAS trellis netting is part of farming protocol necessary to achieve a successful harvest with this solanceae. Using raffia requires a greater amount of manpower and doesn’t allow the plant to spread out and occupy a larger space. 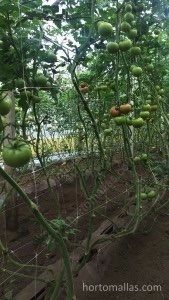 Additionally, each tie attached to the stem of each tomato plant causes a stimulation which leads to mechanical stress from human contact. Unless the utmost care is taken when attaching the ties, the stems could be strangled and starved of the nutrients the plant needs for its development. During the tutoring stage the plant is pruned of its lateral leafs leaving only the main branching stems. This leaves any recent injuries to the plant exposed and is the main vector of transmitting diseases such as viruses, funguses and bacterium. Since hygiene measures tend to lapse during this phase, the crop can easily become contaminated when being tutored. 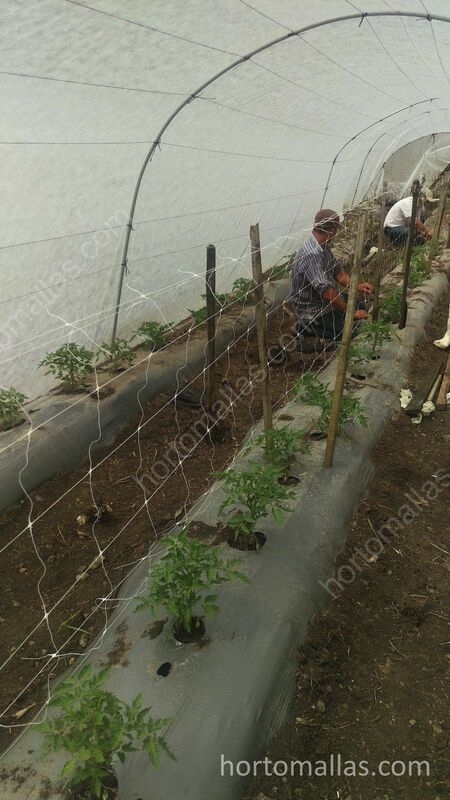 Reducing the contact that the workers have with the tomato plants during this period of guiding obtains good results. 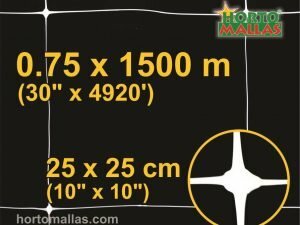 As opposed to raffia tutoring systems which strangle the clusters of tomatoes, HORTOMALLAS acts as a support for the weight of the tomato fruits. Avoids the spread of pathogens as it increase solar exposure and improves ventilation between the plants, thereby reducing moisture levels. Less agrochemicals are required to control pests. Allows for the plant’s foliage to enlarge using the netting as a support during its development until the fruits are ripened. 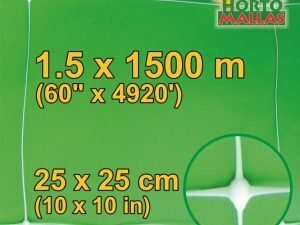 Allows for easy cleaning and removal of weeds which compete for nutrients with the plants. 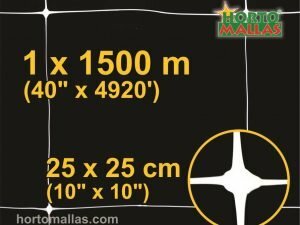 HORTOMALLAS netting can be re-used three to four harvest cycles reducing the recurrent need to invest in materials for each cycle. Tutoring tomatoes with HORTOMALLAS is the best way to reduce the manual transmission of pathogens. 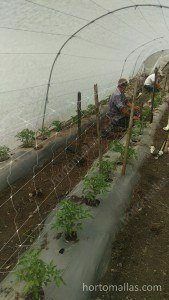 Encouraging a farmer to using support netting to tutor tomatoes does not mean doing away with his traditional methods of farming but rather seeks to support those methods with additional knowledge, complementing his existing practical basis for planting, reducing the need for purchasing raffia for each cycle and cutting down on manpower as well as the amount of chemicals required to control pathogens which damage the crops such as viruses, funguses and bacterium. 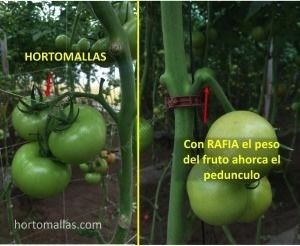 Tutoring tomatoes with HORTOMALLAS support netting facilitates pruning. 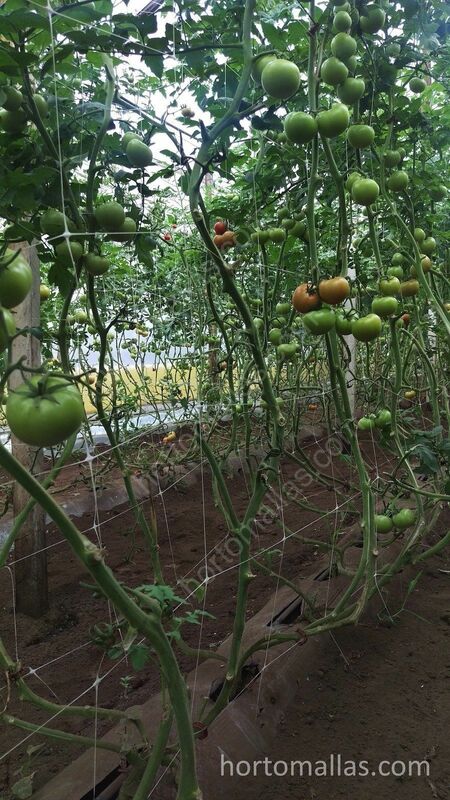 Using this method of tutoring tomatoes, we avoid the initial losses of fruits normally expected as a result of causing stress to the plants from regular contact when checking their development. More than that, phytosanitary control is maintained which is the key to successful crop cultivation which strengthens the farmer’s business. Installing HORTOMALLAS to tutor tomatoes in a double rowed system reduces contact with workers’ hands, representing savings in manpower and reducing the spread of pathogens. This netting is also known as tomato netting. Are you interested in how tomato crops are doing in the USA?